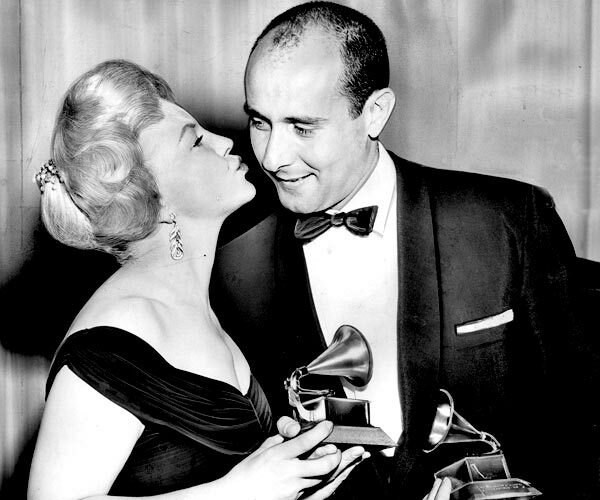 Thrush Peggy Lee presented Henri Mancini with his second award of the night for The Music from Peter Gunn. 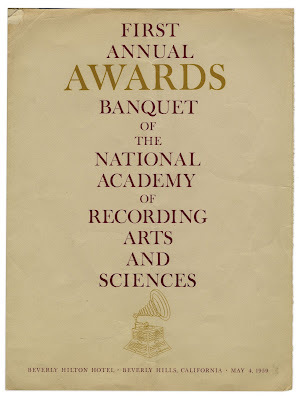 It took a while to get off the ground but the first Gramophone Awards, soon to be known as simply the Grammies, were presented by the newly minted National Academy of Recording Arts and Sciences (NARAS) at ceremonies held at the Beverly Hills Hilton and a New York City ballroom on May 4, 1959. Comedian Mort Sahl hosted the program which was broadcast nationally on NBC Radio and TV. Ratings were unimpressive, but perhaps that was due the stodginess of the industry executives who made the nominations and voted on the winners. Just as Rock and Roll was revolutionizing the music business and sending record sales through the roof, no rock song, star, or record was even nominated. The program cover for the first award ceremonies at the Beverly Hills Hilton. Music industry lore has it that the idea for the awards was hatched by the Los Angeles based recording executives who had been charged with selecting artists to be represented on the Hollywood Walk of Fame. They were said to be concerned that artists could not be recognized for their current achievements. Inspired by the dazzlingly successful Oscar Awards for the movies, which generated audiences and ticket sales in a big way, the industry big wigs decided to make their own awards and create an important sounding organization to sponsor them. NARAS was officially created in 1957 with executives, musicians, producers, and engineers allowed membership and voting rights. But qualifications for Academy membership was set to insure that only veteran industry insiders would vote effectively excluding almost everyone involved in the Rock and Roll revolution. 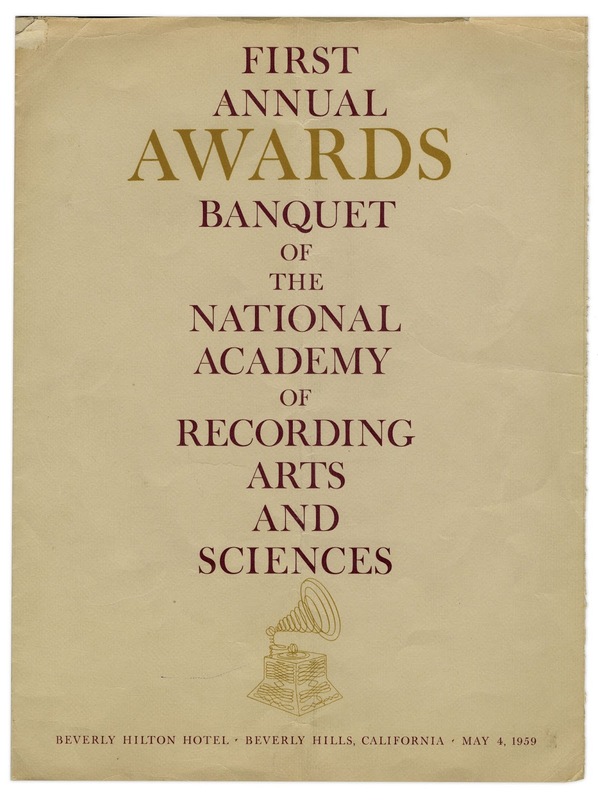 Academy members selected nominees for recordings released in 1958 to be awarded in the May ’59 ceremonies. Meanwhile there was controversy over exactly what to call the new awards, and what they should look like. The early front runner was the Edison or Eddie after the inventor of the phonograph. But Edison’s clumsy cylinder recordings had been rendered obsolete decades earlier by the disk Gramophone player invented by Edison competitor Emile Berliner. 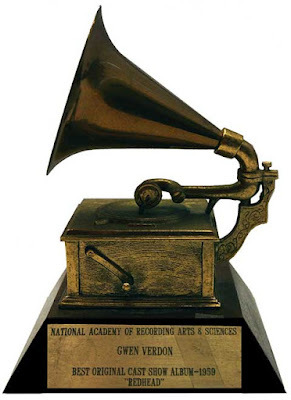 The original awards themselves were a gold plated lead statue of a Gramophone designed and assembled by Billings Artworks in Ridgway, Colorado. Compared to its hefty cousins the Oscars and Emmys, the original trophies were rather diminutive and prone to damage because of their high soft lead content. 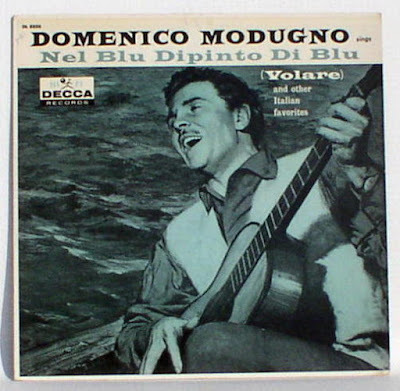 The big winner that first year was Italian hit Nel Blu Dipinto Di Blu—Volare—by Domenico Modugno who walked off with Song and Record of the Year. Also taking home multiple trophies were Ella Fitzgerald for Best Female Vocal Performance for Ella Sings the Irving Berlin Song Book and Best Individual Jazz Performance for Ella Sings the Duke Ellington Song Book and Count Basie for Best Performance by a Dance Band and Best Performance by a Jazz Band. Both Fitzgerald and Basie were impeccable artists and their records are still considered classics but their awards snubbed be-bop jazz that had already been dominant with hep cats for a decade and the emerging West Coast sound. Really? It was a catcht tune, but could it possibly have been the best song and record of 1958--the year of the Everly Brothers Poor Little Fool, Little Rihard's Good Golly Miss Molly, The Platter's Twighlight Time, Buddy Holly's Peggy Sue, Chuck Berry's Johnny B Goode, and Peggy Lee's sizzling Fever? Henry Mancini also did well taking home the gold for Album of the Year for The Music From Peter Gunn and Best Arrangement for the same LP. The extremely relaxed Perry Como won Best Male Performance for his signature Catch a Falling Star. Ross Bagdasarian Sr. who recorded as Dave Seville won Best Comedy Performance for catchy novelty number The Chipmunk Song. Keely Smith and Louis Prima copped the Best Performance by a Vocal Group or Chorus Grammy for That Old Black Magic—undoubtedly the hippest award of the night. The last of the great radio comedians, Stan Freberg won in the Spoken Word category for the collection of skits from his show on The Best of the Stan Freberg Shows. In the musical categories Meredith Wilson’s The Music Man won Best Original Cast Recording and Andre Previn—not composers Lerner and Lowe—won as “performer” on the Best Sound Track Album, Dramatic Picture Score or Original Cast for Gigi. At least two awards are in retrospect real head scratchers and possible snubs to their categories’. The Kingston Trio were a great act and arguably made the late '50's folk music boom possible, but not considered a country music act in Nashville. 1958 was Johnny Cash's big break-through year with half a dozen memorable hits. The folk music boom of the late ‘50’s was in full force but it must have come as quite a shock to Nashville, where amazingly few industry people were eligible for membership in the Academy, when the Kingston Trio won Best Country and Western Performance for Tom Dooley. But the biggest miscarriage was in the award for Best Rhythm and Blues Performance which went to The Champs, a pick-up band slapped together by Gene Autry’s Challenge Records consisting of the rockabilly singer Dave Burges and the Danny Flores Trio. Tequila was a Latin-tinged pop novelty song. It did chart well on both the R&B and pop lists, but it had nothing to do with R&B as generally understood. Black artists were outraged by the selection. 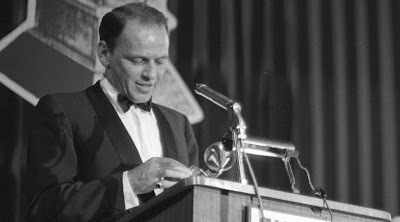 Frank Sinatra, who always like to display his versitility, seemed genuinly thrilled to win for best album cover design. There were other awards in classical and technical categories. And, oh yeah, a guy named Fran Sinatra got one—as art director for the cover of his album, Only the Lonely.